If your meniscus is torn on one side/compartment or have developed OA due to the bone-on-bone rubbing with the meniscus worn thin, you need an unloader knee brace. An unloader knee brace is worn to reduce load on the symptomatic side to either the medial or lateral compartment, relieve painful symptoms caused by your meniscus tear or arthritis, and improve quality of life. Select an OA brace below or click here. If your meniscus is torn on both sides/compartments, you may have developed OA, a unloader is not recommended. We suggest a ligament brace for general knee support if you have developed OA in both the medial and lateral compartments. 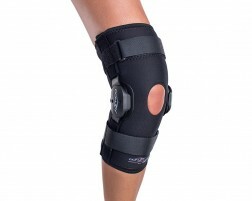 Select a hinged knee brace below or click here. 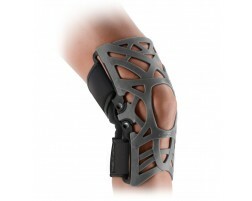 Need additional help selecting a meniscus brace? Use our guided tool, Brace Advisor, for recommendations based on your level of activity and usage of brace for prevention or for a previous meniscus injury. A meniscus tear, also known as cartilage tear, typically occurs through contact sports, although it can be injured in other ways. When the meniscus is torn through sports, it is typically accompanied by other ligament injuries such as an ACL tear. The meniscus is comprised of two pieces of cartilage that reside between your thighbone and shinbone. This cartilage helps cushion your knee joint and keep it stable. It can be torn when your knee is twisted with a lot of force. You might have torn your meniscus if you feel pain, experience swelling, and cannot straighten your leg. RICE treatment (Rest, Ice, Compress, and Elevate) may be sufficient to a slightly torn meniscus. This will provide comfort to alleviate the pain and lessen the swelling as the meniscus heals over time. A major tear may require surgery. The best treatment for a meniscus tear is to understand the injury, rest, and wear a knee brace specifically designed to support a meniscus injury. 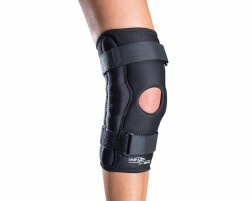 A knee brace ideal for meniscus tears will support the knee in a position to help prevent it from rotating too far in an unnatural direction. It would ideally be worn for daily activities if you have previously had an injury and during sports for prevention whether or not you have previously been injured. Continue reading more about meniscus tears and learn more about why our DonJoy Deluxe Hinged is the best brace for meniscus protection.